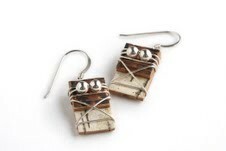 This classic design created by Minnesota artist Deborah Bushinski, features recycled copper from car radiators, intriguing birch bark salvaged from the northern Minnesota logging industry, along with sterling silver beads and wire wrapping. Ear wires are sterling silver and bark pendants measure 3/4" x 1/2". Each piece is hand crafted in the USA. Minor variations in color, texture and size make each piece truly one of a kind.